Fast food chains today offer a dizzying array of menu options, but for a lot of folks, the cheeseburger is and always will be the measuring stick for determining how good the restaurant is. It goes without saying these restaurants serve up different types of fast food cheeseburgers so we’re only going to take a look at their standard or regular offers. 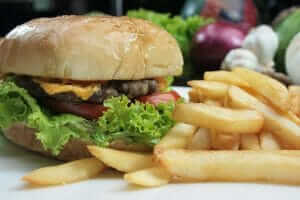 The Big Cheeseburger costs $2.19 and consists of sesame seed bun, burger patty, American cheese, mayonnaise and ketchup. This is a basic burger but you get a substantial patty and the ketchup and mayo blend in nicely, plus it doesn’t leave an acidic aftertaste either. The $1.72 Big Burger with Cheese comes with sesame bun, burger patty, American cheese, mustard, ketchup, white onion and pickle. From the ingredients list alone it’s safe to assume you’re going to get a pretty tasty burger. If you’re an onion lover you’re going to enjoy the center of the cheeseburger as that is where they’re located. A look at Burger King menu prices will show their regular cheeseburger is pegged at $1.19, and as far as the build goes it includes a sesame seed bun, fire-grilled beef patty, ketchup, mustard, crinkle-cut pickles and cheese. This is one of the cheapest cheeseburgers you’re going to find, but it tastes pretty good. The ingredients come together nicely and the grilled meat’s taste is evident throughout. The mustard just has the right amount of flavor, and while the cheeseburger has a lot of toppings they don’t overpower your senses. The waiting time is around 6 minutes, and while that’s longer than some would like, it’s worth it for the taste. The $3.99 Sonic Cheeseburger gives you a seedless bun, beef patty, chopped onion, pickle, tomato, shredded lettuce and American cheese. The waiting varies but it should not take more than 5 minutes and the burger has the reassuring taste of something you’d whip up in your backyard. The patty has just the right texture, not too dry and not too soggy, and the tomatoes have just the right level of crispness. Throw in the soft bun and you’ve got a nice cheeseburger. The regular McDonald’s Cheeseburger costs $1.29 and consists of a seedless bun, beef patty, a single pickle, chopped onion, mustard, ketchup and American cheese. Waiting time is usually around two minutes and while there’s a lot of competition, there’s a reason why this is regarded as a classic. The cheeseburger holds up well, and mostly it’s due to the chopped onion that lets it mix with the other ingredients without overpowering the burger’s texture and taste. The bun on its own is a bit dry, but with the other condiments this is barely noticeable. Admittedly there are cheaper cheeseburgers from Wendy’s, but this $4.29 treat is definitely worth a try. It’s made up of bakery-style bun, American cheese, beef patty, mayo, ketchup red onion, tomato and lettuce. This is more expensive than the other cheeseburgers reviewed here and it shows with the flavor. The cheese melts nicely, the red onion is flavorful and has more bite than those on other cheeseburgers, and the beef has been seasoned properly. Overall this is one of the better regular cheeseburgers available today. Just like the other cheeseburgers on this list you get a beef patty, American cheese, tomato, leaf lettuce and seedless bun. The ingredients may look generic but it’s not especially the griddled, thin patty and the sweet and sour spread that enhances its flavor. Another nice thing worth pointing out here is the lettuce, as it adds a nice bit of crunch to it. The Five Guys’ “Little Cheeseburger” costs $4.39 and their most basic offering doesn’t come with anything as you have to add them yourself. For a typical cheeseburger you’d put in some mustard, ketchup, pickle, onion, tomato, lettuce and a sesame bun, but the highlight here, without question, is the beef, and the crisp lettuce doesn’t disappoint either. The pickles come with some acidity and the sesame bun is as soft as they come. While it’s more expensive than other cheeseburgers, it is definitely worth every cent. If you’re going out and plan to check the latest Burger King menu prices or any of these burger chains, check out these offerings and get a taste of what you have been missing. You left out whataburger, which is way better than McDonald’s or Sonic. One thing is for sure. If you want to have cheese on your burger come to Aiken SC. You will get it whether you want it or not. This place apparently has investments in cheese or either all the fast food workers are ex-citizens of Green Bay Wisc. Honestly, I have tried every way in the book saying “no cheese” when I order and I get it no matter what ! Even told them 3 times last week at McDonalds here “without cheese, no cheese, hold the cheese” at the ordering point, the paying point, and the pick up, so I pulled over and checked and sure enough there’s the cheese ! Some of us are highly allergic to cheese, causes itching and a rash, even sickness in some, so COME ON PEOPLE IF WE SAY ‘NO CHEESE’ THERE IS A REASON ! There’s 2 places that are so bad I no longer go to the, and that’s Sonic and Checkers. They lose a lot of business as I am a fast food junkie ! Complaints do no good, so I just gave up.